Can ‘microswimmers’ swim through jelly? Tokyo, Japan – Researchers from Tokyo Metropolitan University have studied how microswimmers, like bacteria or sperm, swim through fluids with both solid and liquid-like properties e.g. gels. They found that subtle changes in swimmer features, its structure and how it moves, invoke a dramatically different response from the fluid. They also discovered that the similarity in size between the structure of the fluid and the swimmer led to a wide range of interesting behavior. Swimming is a tricky business for the microorganism. It might not seem that hard when we take a dip in the pool, but at microscopic scales, or at low-Reynolds number, the effect of the viscosity of the surrounding fluid imposes severe constraints on how one can swim. Yet, nature succeeds in achieving it; microswimmers play vital roles in a wide range of phenomena. Take reproduction i.e. sperm, or the active motion of bacteria. Understanding how they work is important business. To understand swimmers, previous studies have focused on how minimal models of swimmers behave in uniform fluids. A particularly popular model is the so-called three-sphere microswimmer, a string of three microscopic spheres attached to each other by arms; the string can be propelled forwards by pumping the arms backwards and forwards in a liquid. This simple structure lets us overcome the limitations of the "scallop" theorem of Purcell, which says that motion which looks the same when played backwards (time-reversal symmetry), like a scallop opening and closing, cannot be used for locomotion. But what about the fluid? 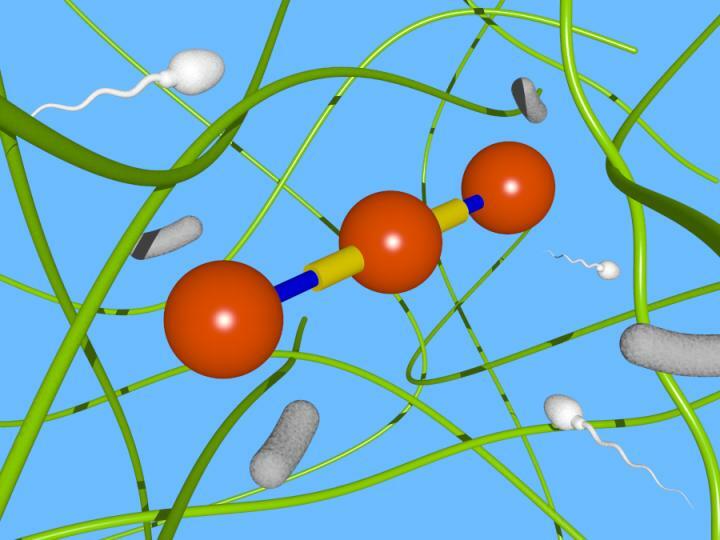 Take how sperm travels through cervical mucus to reach eggs in mammalian reproduction; the mucus is an example of soft matter, where the internal structure, in this case made of sugars and proteins, responds in a complex fashion to the motion of the swimmer. To address this issue, a team consisting of Kento Yasuda and Associate Professor Shigeyuki Komura of Tokyo Metropolitan University and Ryuichi Okamoto, a Lecturer at Okayama University, studied how three-sphere microswimmers behave in a structured fluid, a polymer gel e.g. jelly. Their analysis revealed that there were broadly two mechanisms for achieving motion, one by breaking time-reversal symmetry, the other by modulating the amplitudes in the beating of the two arms of the swimmer. With the latter, it was found that swimming could be achieved without breaking the former symmetry, a loophole in the scallop theorem. Through further detailed analysis, they succeeded in deriving expressions for how the velocity of the swimmer was related to how a structured fluid resists the motion of a swimmer. Interestingly, they found that when swimmers were larger than the mesh size of the gel, there was greater resistance with faster beating, a somewhat counterintuitive conclusion. This work marks significant progress in bringing a popular minimal swimmer model closer to experimentally relevant cases, including the beating of hairs ("cilia") on cells and the motility of bacteria. It may also see application to more exotic scenarios e.g. the locomotion of robots through debris after landslides. This work was supported by a JSPS KAKENHI Grant-in-Aid for JSPS Research Fellows (18J21231) and for Scientific Research (C) (18K03567). The study has been published online in the journal Europhysics Letters. FeCo-selenide -- Next-generation material in energy storage devices?